1. 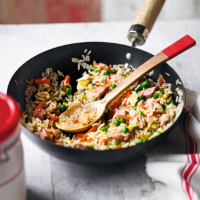 Heat the oil in a wok or frying pan and fry the gammon for 3 minutes, add the vegetables and rice and cook for 3-4 minutes. 2. Stir in the soy, honey and egg and cook until the egg has scrambled. Season.